Proper organization of the fields on your forms can make them easier to use. Such as, grouping like fields into sections or tabs and using descriptive text in either alternate labels or text elements. Now that's how you make a good look'n form! 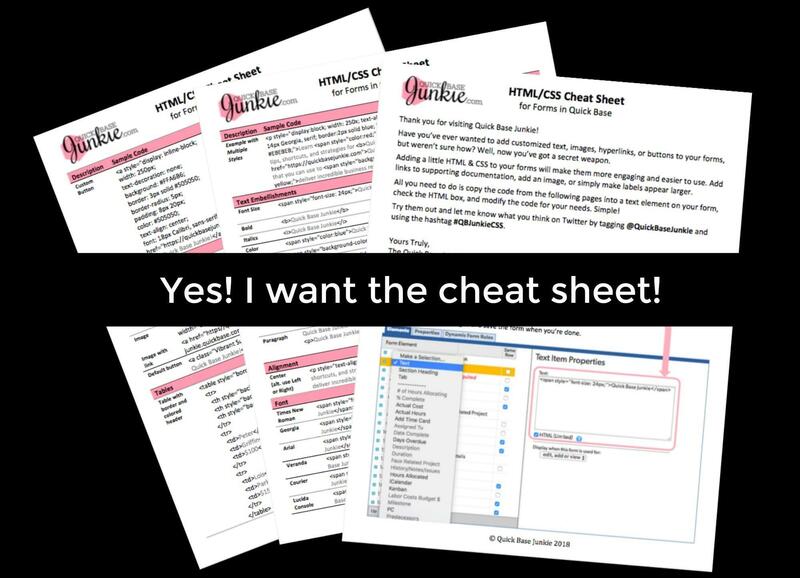 In this video, I mention the HTML/CSS Cheat Sheet. The cheat sheet has examples of how to format text using code. With this code, you can make text bold, larger, colored, and much more. Get the cheat sheet now. FROM THE VIDEO: "...I may also want to place age next to date of birth. Let's take a quick look at how this looks. We could either use the preview or the save option. I'm gonna use save. Okay now we can see that we have several of our fields located on the same row as another field. While I've only placed two on the same row you can actually place more than two on the same row. Probably not more than three or four, but it's possible to add multiple fields along the same row. Now it still looks a little cluttered this way. Let's take a look at how we can divide this into different sections. I'll go back into the form customization and now let's add some sections. I'll add a section before 'department' to separate it from the 'employee name' and the 'employee number.' I'll choose this row and click insert. This inserts a row above the item I'd selected. And then I'll choose section heading. I can give this section a name I'm going to call it 'current position.'... Now you can see these different sections. I've got a section for 'current position' with the field labels to the left. Another section for 'date' with the field labels above. And if I scroll down, I've got another section for 'personal details.' Again with the field labels to the left. Now I'm starting to look much more organized... There's also the option to add tabs to your forms. These are similar to sections only it puts it in a tab instead of a section. I'll show you what that looks like. I'll change this last section heading here to a tab, and I can choose a tab color let's make it bright...The form customization also allows us the option to add text so we can add any text we want to the form. This is great if you have instructions or other details that you want to leave for the people who will be using the form. So let's go into our form settings, and I want to add a note just before 'hire date.' So I'll select 'hire date' and insert and then choose the text option. And here I'll add my text. I can save my form. And now I can see on my form that text for the hire date. If you want more information on how to use the text field on forms and ways that you can customize the text (making it bold, larger, or adding color, check out my HTML cheat sheet) the link will be below. The one last thing I want to show you is how you can change the labels...You can also move the fields around, add and delete fields, place them on the same row, add sections or tabs, add text, and change labels. Give me a thumbs up in the comments if this helped you out. And once you have everything where you think it should be, go ahead and ask some of the people who'll be using the form what they think. 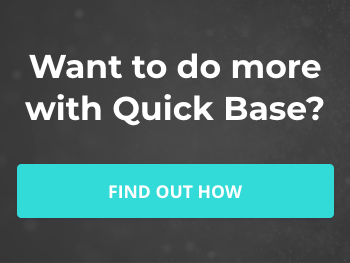 Quick Base makes it easy to make changes. To learn more about the field settings and personalization options check out my video on the 7 Must Know Form Properties on the Quick Base Junkie Blog..."